Plenty of airports have a great assortment of places to whet your whistle before taking off. But none have one quite like the newest addition to London’s Heathrow Airport. The Grey Goose Loft at the Virgin Atlantic Clubhouse at London Heathrow marries the World’s Best Tasting Vodka, and the Virgin Atlantic Clubhouse – hailed as the world’s best airport lounge. 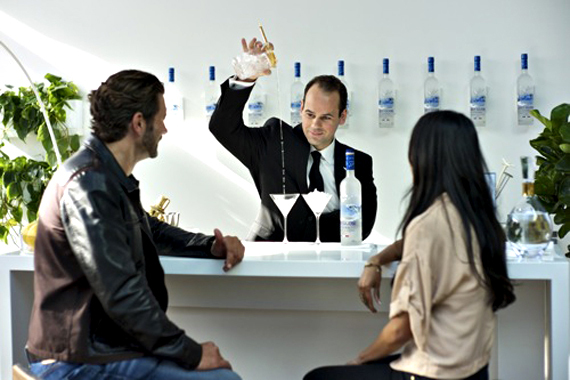 Located on the upper deck of the Clubhouse, it welcomes Upper Class passengers with a Grey Goose cocktail freshly prepared by a team of professional mixologists from some of London’s best bars. The loft boasts the best in new design, with individual items of furniture created by some of Europe’s most talented young designers. Integrated into the design of the bar itself is a DJ booth where guest DJs will set the mood to accompany the cocktails.